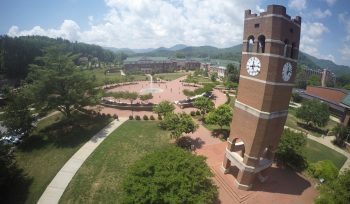 Welcome to another episode of the WCU PodCats, the official podcast of Western Carolina University’s Office of Undergraduate Admission. We debut our first Top 10 episode in honor of applications for Fall 2016 becoming available this Wednesday, August 12th. Patrick and Josh discuss the top 10 things you should know when applying including: when and how to apply, official v. unofficial transcripts and SAT/ACT scores, financial aid availability, and much more! If you are interested in applying for next fall please visit apply.wcu.edu on or after August 12th. Don’t forget that you can find us online at podcats.wcu.edu, @WCUPodcats on Twitter, WCU PodCats on Facebook, and on iTunesU where you can subscribe and download new and old episodes. Thank you so much for doing this podcats! I completed my application today. I hope to see a lot of purple in my future! Thanks for listening, we are glad you enjoyed the show and hope to see purple in your future as well!